For those who haven’t seen it, Dan Frakes of Macworld magazine wrote about Pear Note in his Mac Gems column a couple days ago. It was a great article, and he probably explains Pear Note better than much of the documentation on this site. He also had some very good critical points, many of which I’ve heard before from all of you. Rest assured that Pear Note is in very active development, and I hope to have most of the issues Dan raised addressed by the release of 1.3 later this year. Up until now, beta testing of Pear Note has consisted of occasionally throwing a build at friends or fellow Mac developers and asking them to play with it or wandering down to the local Apple store to test builds on differing hardware. Thanks to a couple of you alerting me to license validation problems (and if anyone else has this problem, I’d love to know if the latest beta build solves it for you), I’ve realized that there are now way too many users of Pear Note for this process to be sufficient. So I’m now seeking beta testers from all of you users. If you’re interested, please drop me an email (as always, chad@usefulfruit.com). You’ll get access to features early, with the slight risk of getting access to bugs early as well. Anyone willing to submit a bug report for any problems they find is welcome to become a beta tester. I’d especially like people that have webcams around, as I hope to increase the number of webcams supported by Pear Note in an upcoming release. That said, don’t let not having a webcam hold you back if you’re interested. Pear Note is designed first and foremost for taking notes live, such as in a meeting, class, or conference. That said, I’ve found another use for it that I never anticipated. Pear Note actually works great for taking notes on documents as well. I recently had to review a 300 page document. Some people like to take notes directly on documents, but I don’t find this to be very useful as I have to flip through 300 pages to find the bits and pieces of my notes. So, I’ve usually just taken notes all on their own, and tried to remember to constantly annotate them with page numbers so I can later refer to the original document. This didn’t work well, as I’d still have to flip through the master document (though at least I knew what page to look for). Not to mention that I’d frequently forget to write down a page number, which left me searching again. Staring at this 300 page document, I realized that I could use Pear Note to make this much easier. Pear Note supports adding any PDF file as slides, so I just turned my 300 page document into a PDF and added it to a Pear Note document. I then turned off audio/video recording and hit Record (which will record timestamps for keystrokes and slide changes just like normal). This way, my notes and my page changes were all recorded, so I can always get to the appropriate page when referencing my notes. I just hit Play and click wherever I want to look at. 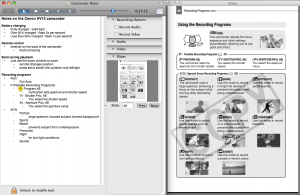 Below is an example of my notes on my camcorder manual. 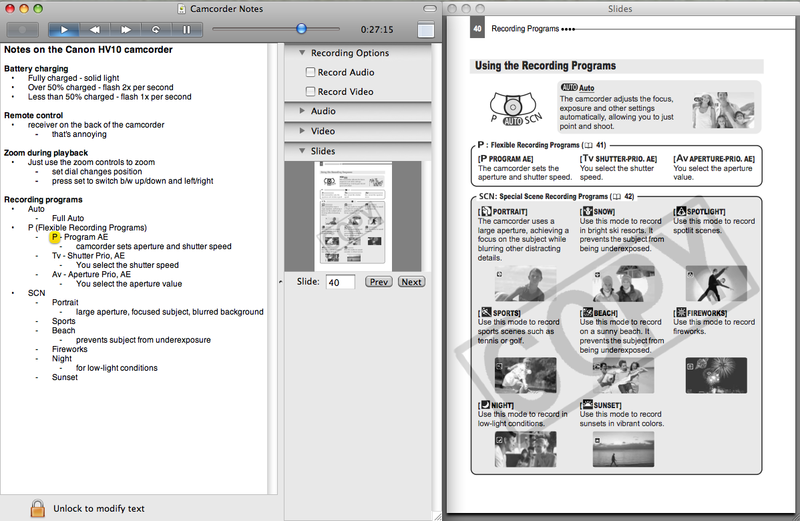 I can click on “Program AE” and jump right to the page in the manual that covers that topic.